With fall less than a month away, cooler weather is already beginning to make an appearance in Pennsylvania. We would like to take this time to reflect on our summer activities, and share our upcoming events. 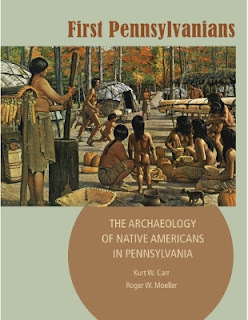 The summer of 2015 saw the release of “First Pennsylvanians: The Archaeology of Native Americans in Pennsylvania”, a comprehensive book on the area’s prehistoric inhabitants. Intended for use by the general public, it is the first book of its kind published in Pennsylvania. Authors Kurt Carr and Roger Moeller describe the lifeways of early Pennsylvanians during each time period of their 16,000 year occupation of the region. The 246 page book is richly illustrated with 263 photographs, drawings and maps and has been describe as a museum on paper by local public radio host, Scott Lamar. For $29.95 “First Pennsylvanians” is available in paperback from Shop PA Heritage, Amazon.com, and other book retailers. The season also ushered in a new series of presentations held in the Nature Lab on the third floor of the State Museum. 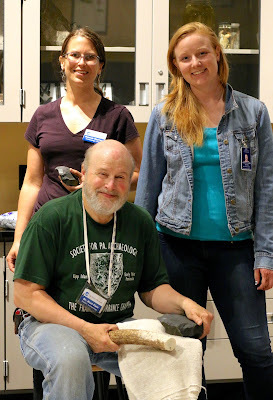 The archaeology staff was on hand every Thursday afternoon to present different topics on Pennsylvania archaeology. Topics ranged from prehistoric stone tools and pottery to current compliance archaeology projects in the Commonwealth. With the conclusion of this summer program, we would like to thank all those who attended the presentations, and everyone who worked behind the scenes to make this series a success. Every fall since 2006 the Archaeology Section has led an excavation at Fort Hunter Mansion and Park in Harrisburg, PA. On September 2nd (less than a week away!) the search for the fort at Fort Hunter Mansion and Park will resume. 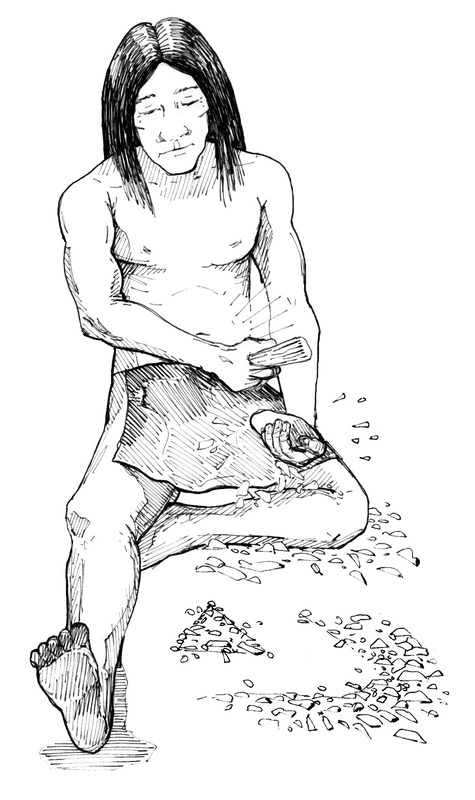 Excavations have documented the historic and prehistoric occupations at the site. While previous years have not been successful in locating the stockade or other fort structures , a new year brings new opportunities, and archaeologists will be on hand Monday-Friday, 9am-4pm to answer questions about the site and offer brief descriptions of the archaeological process. In addition to weekdays, excavation will take place on Fort Hunter Day, to be held Sunday, September 20, 2015. Excavations will close on October 2, 2015. The Archaeology Section will make their annual appearance at Kipona Festival, Harrisburg’s free festival celebrating the Susquehanna River. Our booth will be located on City Island, west of the baseball field. Look for the Pennsylvania Historical and Museum Commission blue banner and the 20 foot dugout canoe. Stop by, have a seat in the canoe and learn about the prehistory of the area. Artifacts recovered from excavations on City Island in the 1990’s will be on display. Staff and volunteers from the Section will be present during the event to answer questions and offer insight. The Archaeology Section of The State Museum of Pennsylvania invites you to attend the annual Workshops in Archaeology on Saturday, November 14, 2015. This program is designed to provide the general public with an overview of archaeological discoveries across the Commonwealth. This year’s theme is “Weed Seeds to Garden Seeds: The Archaeology of Plant Foods and Farming in the Keystone State.” In addition to the presentations, attendees can share their archaeological discoveries with staff from the Bureau for Historic Preservation who will provide assistance with artifact identification and recording archaeological sites, an essential task for protecting and preserving our archaeological heritage. An additional offering includes a demonstration by a master flintknapper who will make stone tools using Native American techniques. A reception at the close of the sessions will provide an opportunity for the attendees to meet with the presenters and staff in the Anthropology and Archaeology Gallery of The State Museum. The program and registration form are available from our website. If registered before November 6th, the cost is $25 for the general public or $15 for students and $15 for members of the Heritage Society, SPA, or PAC. The cost of registration at the door is $35. October is Archaeology Month in Pennsylvania. The Society for Pennsylvania Archaeology will have programming throughout the Commonwealth that is open to the public as well as these opportunities offered through The State Museum. We hope to see you at one of our many upcoming events! 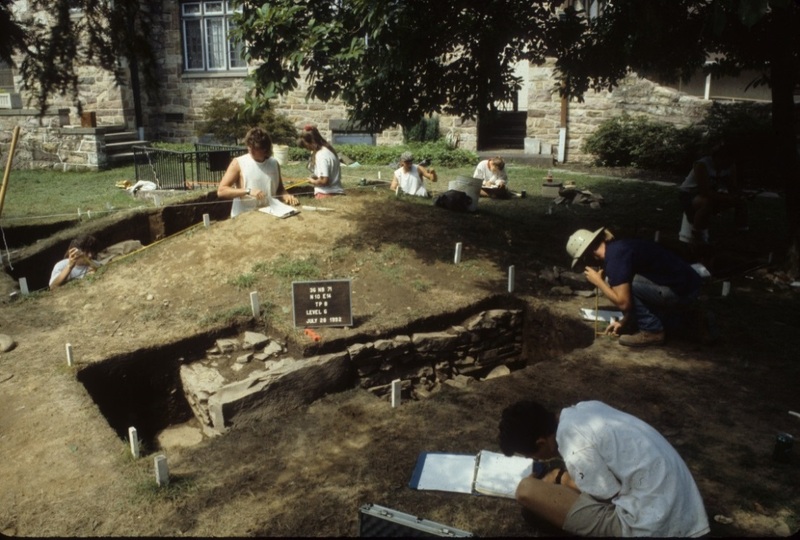 Our review of the last 50 years in Pennsylvania Archaeology continues with a project that was conducted in the late 1970s at historic Fort Augusta in Northumberland County. Fort Augusta is located at the confluence of the North and West branches of the Susquehanna River in the present town of Sunbury, Pennsylvania. This fortification was part of a line of forts and blockhouses constructed during the Seven Years War, also known as the French and Indian War, in the mid-eighteenth century. By the early eighteenth century, an Indian village, Shamokin, was established at this location. Shamokin was home to the famous Indian negotiator Shickellamy and his family and later also housed Moravian missionaries. In the mid-1700s, fear of attack by the French and their Indian allies led to the abandonment of the village and a request from the local natives to the British to place a fort in this location. During July 1756, construction of a large, fortified log structure was initiated by Colonel William Clapham, but it was not completed until 1757 under the command of Colonel James Burd. The fort was constructed mainly of logs and earth and plans show that it was in the form of a square with diamond-shaped bastions in each corner. A wide, dry moat and stockade surrounded the fort and provided protection for the barracks, powder magazine, water well, and other interior structures. 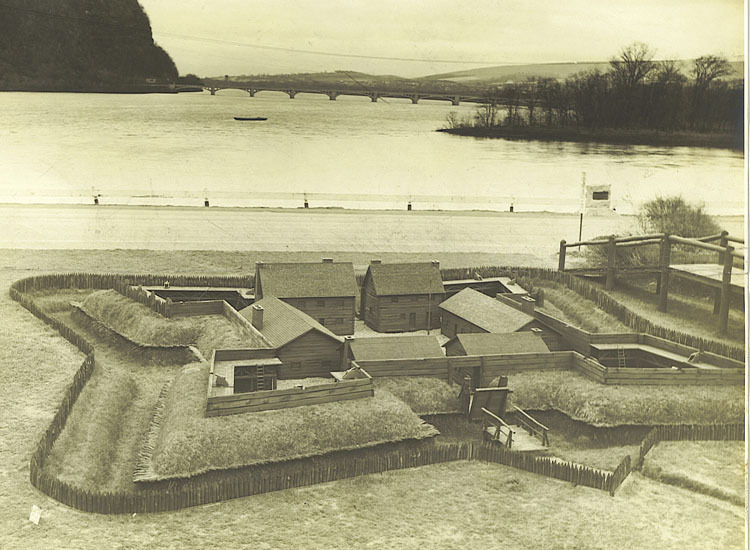 An outer stockade with four blockhouses along the Susquehanna River provided a protected area for boats coming upstream with supplies from Harris’s Ferry and Fort Hunter to land. Although frequent raids by French-allied Indians occurred, Fort Augusta was never attacked by the French and it provided protection to the local inhabitants, friendly natives, and soldiers until the hostilities ended in 1762. The fort was utilized again during Pontiac’s Rebellion (1763) and the Revolutionary War but was demolished by the end of the eighteenth century. A later fort commander, Samuel Hunter, eventually retained a portion of the property and built the Hunter Mansion. (Please note, this site is not to be confused with Fort Hunter Mansion & Park in Dauphin County, Pennsylvania.) Hunter Mansion became a museum and headquarters for Northumberland County Historical Society in 1989. The only remains of the fort that are visible today are the well and the powder magazine. 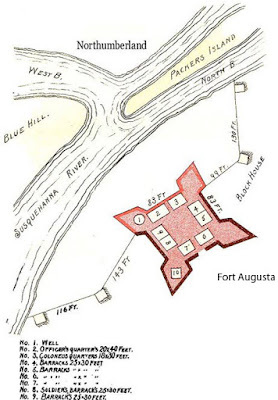 The general location of Fort Augusta was known as early as 1896, when the Report of the Commission to Locate the Site of the Frontier Forts of Pennsylvania was published (Busch). This report attempted to locate and document all of the early frontier forts in the state. A Works Progress Administration (WPA) investigation of the fort was conducted in 1938 in the front yard of the Hunter Mansion. In addition to locating the remains of Fort Augusta, work included the construction of a large-scale model of the fort and the renovation of the Hunter Mansion. Unfortunately, excavation records from this investigation have not been located. Although French and Indian War-period artifacts were recovered and portions of the fort structure were identified, as well as Native American burials uncovered, there is little record of the results except for a short article in Pennsylvania Archaeologist (Godcharles 1938:75). The archaeological site of Fort Augusta was assigned the trinomial designation of 36Nb0071. 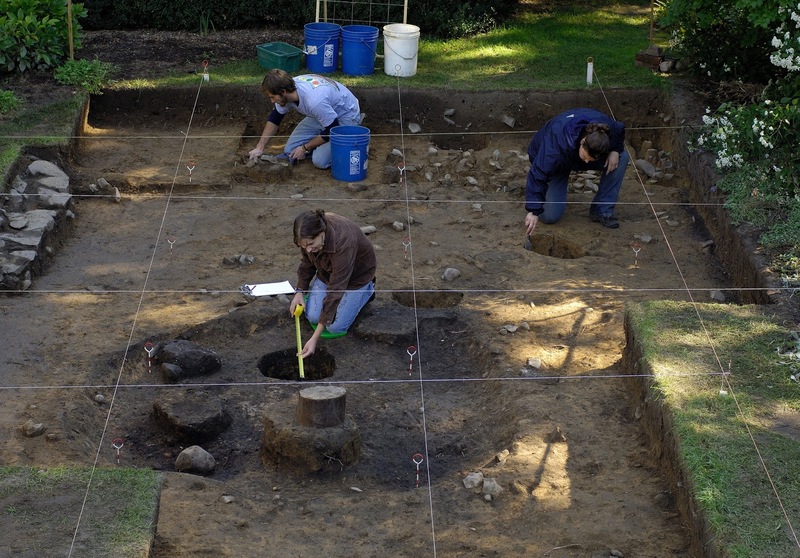 In an attempt to reveal the construction and layout of the fort, archaeological investigations were conducted in 1978 and 1979 on a vacant property (called the Charles Cobler property) just north of the Hunter House. Trenches placed on the Cobler property indicated the presence of large amounts of fill materials associated with the fort construction and its demolition. Below this, archaeologists uncovered the remains of the earlier Indian occupation of the town of Shamokin and even earlier prehistoric occupations. 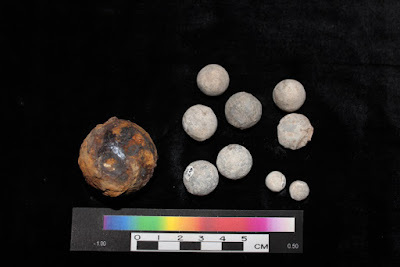 Portions of the palisade wall, trench, and the dry moat were discovered and fort-period artifacts such as animal bones, musket balls, gun parts, buttons, cannon balls, and colonial ceramics as well as earlier Indian objects were recovered. In addition, fragments of iron and brass, slag, charcoal, worked gun parts, stone from a foundation, and highly oxidized soil indicated the presence of a “smithy” or blacksmith shop. This shop was identified as that constructed by the Moravian missionaries, who lived at Shamokin from the 1740s to 1755 (Nichols 1979). Subsequent investigations were conducted in 1981, 1992, and 2005/2006 in attempts to better define and locate the structures identified in historic documents. In 1981, trenching was conducted in a parking lot, which would be impacted by a construction project, and in the probable location of the fort’s northeast bastion. Excavations in this area of the parking lot yielded mainly Indian artifacts while excavations in the supposed bastion uncovered the remains of a log footer, the dry moat, and a fort-period pit feature in conjunction with minor amounts of military artifacts (Lewis 1981). The 1992 excavations concentrated on the powder magazine, which was to be repaired. Investigations established the relationship of the magazine to other features of the yard and determined that much of the artificial fill over this feature was due to a nineteenth century tower placed in this location (Warfel 1992). In 2005/2006, testing was conducted in conjunction with a proposed new library and reconstruction of the large-scale fort model on the front lawn of the Hunter Mansion. Large amounts of fill were also found during this investigation as well as additional remains of the fort wall, dry moat, and other fort-related features (Delle 2006). Taken as a whole, the various excavations at Fort Augusta have allowed investigators to position the fort on the landscape of modern Sunbury, determine construction methods, locate elements of the earlier Shamokin town and Moravian blacksmith shop, and match physical evidence to the written accounts of this period of Pennsylvania history. In 2013, the large-scale model, which had been previously dismantled, was reconstructed at the Hunter Mansion. 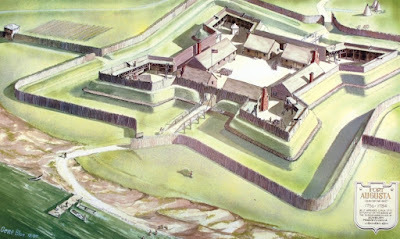 For more information on Fort Augusta or the Northumberland County Historical Society, please check out their website at http://www.northumberlandcountyhistoricalsociety.org/default.asp. 2015 Bucknell University website. As found at www.departments.bucknell.edu. 1896 Report of the Commission to Locate the Site of the Frontier Forts of Pennsylvania, Vol. 1. Harrisburg: State Printer of Pennsylvania. 2006 Phase II Archaeological Investigations at Fort Augusta, Sunbury, PA; Preliminary Report on 2005 Excavations. Prepared for the Northumberland County Historical Society in cooperation with the Bureau of Historic Preservation. 1938 Valuable Recoveries at Fort Augusta – Work Done by WPA Project. The Pennsylvania Archaeologist VIII (4): 75-78. 1960 Forts on the Pennsylvania Frontier, 1753-1758. Harrisburg: The Pennsylvania Historical and Museum Commission. 1981 Fort Augusta: 1981 Archaeological Field Investigation. Manuscript on File, Pennsylvania Historical and Museum Commission. 2015 Northumberland County Historical Society website. As found at http://www.northumberlandcountyhistoricalsociety.org/default.asp. 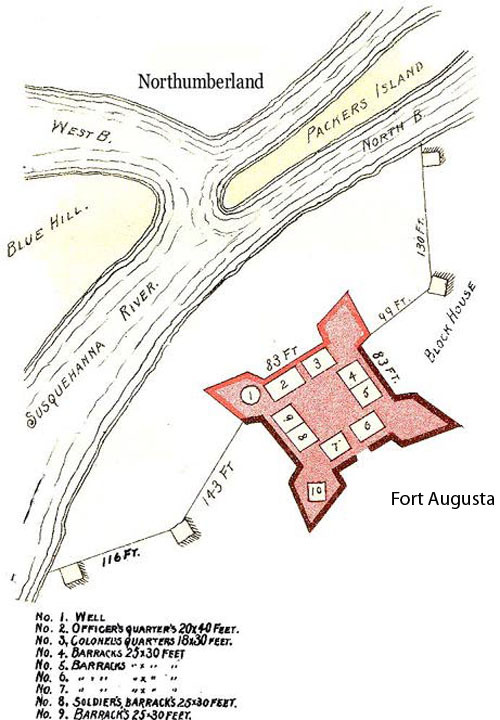 1993 Archaeological Investigations of the Powder Magazine at Fort Augusta. Northumberland County Historical Society Proceedings 31:7-56. For more information, visit PAarchaeology.state.pa.us or the Hall of Anthropology and Archaeology at The State Museum of Pennsylvania .